The Vimanmek Mansion, in the Dusit district of Bangkok, is also known as the Vimanmek Palace. It was originally constructed as a palace at the end of the 19th century. 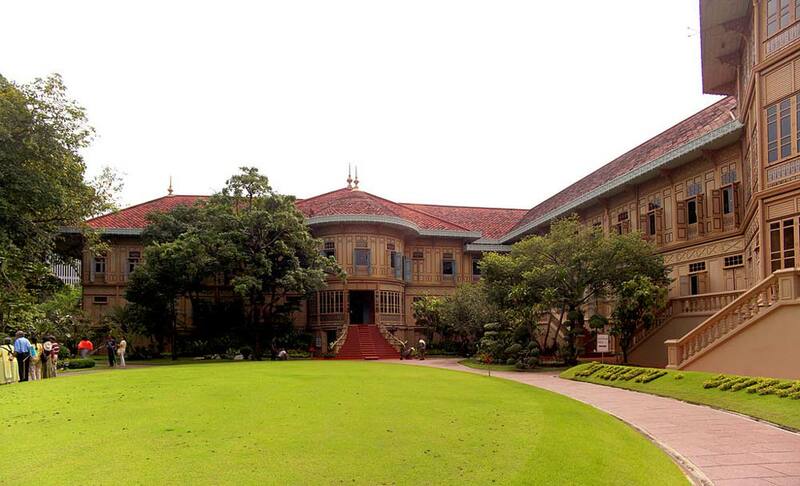 However, the royal family of Thailand used the mansion for only a few years. It is now open to the public as a tourist attraction. King Rama V of Thailand made a tour of Europe in 1897, in the course of which he saw a number of European royal houses. This gave him the idea for something similar in his home country. Once back in Thailand he bought a large area close to the Samsen and Padung Krungkasem canals. Here he began what was to become known as the Dusit Garden, with the palace itself being constructed awhile later. The building itself was not built from scratch; instead, it was brought from Chonburi, having previously been the residence of Munthatu Rattanaroj in Chuthathuj Rachathan. The newly-sited building was carefully decorated to mix traditional Thai and neoclassical European styles. The palace’s reassembly was so careful that no nails needed to be used. A ceremony marking the official opening of the palace took place in March of 1901. After this, King Rama V used it as his primary residence for several years. In 1906, when Amphorn Satharn Villa was completed, the Vimanmek Palace was largely abandoned. By the 1930’s it had become little more than a storeroom for the royal household. It was not until 1982 that King Rama IX granted permission for the palace to be turned into a museum dedicated to his predecessor. The mansion has now become the home of a large number of artifacts associated with Rama V, including both personal possessions and a collection of items he had brought back from his time in Europe.